... means of control accessories. Very reduced and compact dimensions and weights. 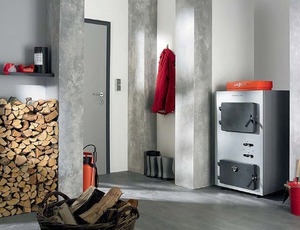 Easy transport, access and location in boilers rooms. A boiler is the central element of a hot-water heating system. After being heated, the water is piped to the different areas of the structure. There are also boiler fireplaces and boiler stoves that heat the air in a main room while supplying hot water to the rest of the dwelling. Kitchen stove boilers offer cooking options in addition to heating water. Fireplace and stove models may be decorative as well as functional. Standard boilers heat water to 90° C, while low-temperature models heat to only 40° C. Commercial installations feature high-temperature boilers for steam heating. Condensing boilers are very efficient, offering energy savings to 30%. They use condensed steam recovered from flue gases to heat the cold water on the return side of the system. Choice of boiler will depend on its capacity, energy consumption and fuel type, including gas, electricity, fuel oil, wood or multi-fuel. Low-temperature and condensing models are favored where saving energy is a priority.